At essence, All Tvvins are a live indie-rock band underpinned by a maelstrom of synths, their collision of disparate influences results in a sound akin to a melting point of TV On The Radio’s art-pop twists with the leftfield psychedelic excursions of Animal Collective. Even just a snapshot of All Tvvins’ songbook demonstrates an admirable disregard for conventional genre boundaries. Adams met All Tvvins partner Lar Kaye on the Dublin underground circuit some ten years ago when they were both teenagers. Adams and Kaye spoke of working together way back when, but it didn’t actually happen until the summer of 2013. 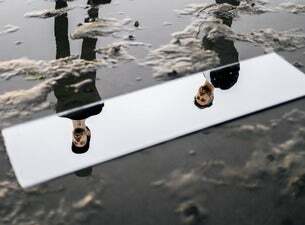 All Tvvins soon embarked upon a streak of activity which stretches to the present day. Both sonic experimentalists and multi-instrumentalists (Kaye was “renowned for being the best guitarist in Dublin”, says his bandmate who specialises in vocals and bass), the duo’s eight-hour sessions of writing and recording have resulted in over 40 demo tracks for their upcoming debut album. Since then, they’ve opened for Arcade Fire and The Pixies at a gargantuan homecoming show at Dublin’s Marlay Park; earned the respect of new wave pioneers Blondie following a set at Electric Picnic; and played at the famous Olympia Theatre as guests to Editors. And that’s all before their debut album has even been completed. With sessions for it well underway names like Jim Abbiss (Arcade Fire, Kasabian), Cam Blackwood (George Ezra, London Grammar), Mark Rankin (Queens of the Stone Age, Bombay Bicycle Club) and Matt Schwartz are among those enlisted as All Tvvins’ partners in sound. The aim they agree, citing the continuing evolution of Radiohead, is to create a legacy of albums – not just something that will be remembered as a fleeting flavour-of-the-month, but a body of work that will stand the test of time.